Consumer Watchdog: Do you want an award? What about a fancy certificate that you can frame and put up on your office wall to impress visitors? What about a gold-painted trophy you can put on your desk. That’ll impress people and bring in new business, don’t you think? You could fake one I suppose, that’s easy enough. Like fake degrees, anyone with a laptop, some high-quality paper and a color laser printer could produce a fake award in half an hour. But that’s not so impressive. What about getting a real award? Or a semi-real award? Impressive, don’t you think? Or is it? Other than being a company based in Madrid, Spain, who exactly is this company, Business Initiative Directions? What qualifies them to give awards? That’s a very difficult question to answer. Their web site makes it clear that they have a history of giving companies awards but that doesn’t explain how they’re qualified to do so. I think there’s a simpler question to answer. How do BID benefit from this award ceremony in New York? What’s in it for them? They make money from it. A lot. 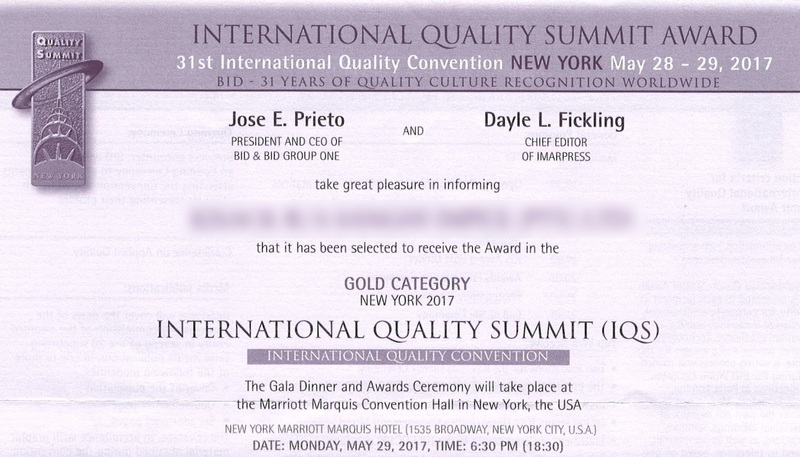 The attachments in the award email explain how you get to attend the two-day ceremony in New York. You pay BID “participation costs of 4,200 euros” to attend. 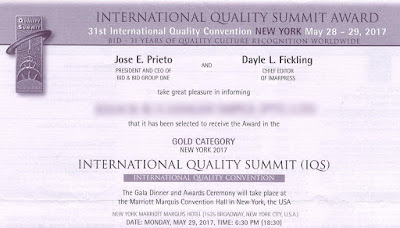 That’s about P45,000 and for that you get “Two invitations for the IQS Gala Dinner Ceremony”, a trophy, a certificate, a manual of graphics you can use to market your award, a press release, some photos of you and your colleagues getting the award, “two gold-plated lapel pins”, an opportunity to speak at the ceremony and two nights in the Marriot Marquis Hotel where the ceremony will take place. The small print then explains that the hotel accommodation “will be provided in one double occupancy room”. So let’s summarise what you get for your P45,000. Dinner for two people, two nights in a hotel room that you must share with a colleague, a trophy, two lapel pins, some photos and a whole lot of paper. Did you notice what was missing from that list? The travel costs to New York. I did some amateur research and this is what this “award” will actually cost you, all conveniently converted to Pula. P45,000 for the ceremony and shared hotel rooms, around P25,000 in economy class flights from Gaborone to New York, maybe another P5,000 in transit, food, drink and living expenses, making it a total of P75,000. I also checked the price of the hotel rooms for the dates in May when the ceremony is taking place and the basic room rate for two nights will be about P6,000. Given that BID will have booked many rooms for the people attending I’m sure they got a special rate. And yes, remember that the ceremony fee includes the room so even if you decide to stay in a cheaper hotel of with your cousin who lives in New York, you’re still paying for the Marriot Marquis Hotel, whether you’re there or not. Let’s be generous and add in another P5,000 per “winner” for the conference room, dinner, photographer and the rather vulgar trophy you receive and I suspect that BID make a profit of at least P30,000 for every award they give away to the companies fool enough to part with that sort of cash for the privilege of attending. So that’s why they’re offering these awards to companies around the world, companies that might have no track record of ever achieving anything or of actually deserving an award. It’s all about the money. And some psychology. Here’s another thing about why these awards are persuasive, why they sucker people into parting with such large amounts of money. It’s what psychologists call cognitive dissonance, the stress experienced by someone simultaneously holding contradictory beliefs. The knowledge that they’re spending P75,000 for a trophy, a dinner, some photos and a certificate they secretly know are probably worthless leads them to self-justification: “I’m not stupid, the fact that I spent all this money must mean it’s worth it.” Their critical faculties dissolve and they construct elaborate justifications for their actions. The fact that they have a trophy for their desk, a certificate for their boardroom wall and a logo for their web site are enough for them to suppress the stress they felt when they realised they just wasted someone’s salary on a worthless prize. Then they’ll discover something else. Something that will burst their balloon, something that might bring their cognitive dissonance back with a vengeance. Check this for yourself. Google “Business Initiative Directions” and you’ll find that after their own web site, the third most popular response is from guess who? Yes, Consumer Watchdog, warning people in 2010 about their awards scheme and suggesting that people shouldn’t waste their money on something so suspicious. Do you really want that, an award that many people question, that your customers, competitors and employees might very quickly conclude is bogus? Is that the sort of award you want to support your fragile ego? Wouldn’t it be better to invest the P75,000 in some market research, staff training or new web site? Better still, why don’t you spend the money on your own awards ceremony. Spend it on your staff and give them a dinner to remember and some prizes for the best performers. That’ll improve your business much more effectively than a silly trophy.